sleeping peacefully together until caught in the act! The only war going on around here these days is the War on Sleep. It has been an all-out assault against the Land of Nod, and subsequently on my parents who have determined that, one thing far worse than having jet lag is having babies with jet lag, which equals baby lag. So after a full week of baby lag and then a week of welcome-back-to-school runny noses followed by a ferocious bout with Only God Knows (teething perhaps? 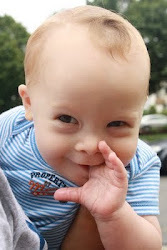 ), Lucas and I are setting epic records of sleepless nights thus accounting for fuzzy brains and zero blogs. And you thought it was the rockets. Since my parents anticipated hell's fury when we got back from three weeks in the US, they opted for an all or nothing policy regarding our sleeping arrangements. Before we left for the US in late October, I had been in the crib while Lucas was in a pack and play next to my parents' bed. There has been an empty bed in my room awaiting my arrival ever since Lucas' arrival last December. 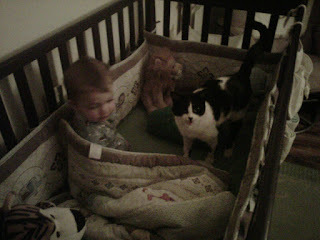 Everyone assumed that Lucas could hop into my crib and that I would gracefully adjust to a toddler bed. Well, its been 11 months now and I finally seem to have gotten the message across that the bed is going to continue to wait for me for a long time. Mommy and abba tried to prod me into the bed when we got back two weeks ago. I applaud the effort and the logic of gesture. Jet lag, however, was on my side not theirs. I would emerge from the bed and appear at various places in the apartment shortly after being put to bed. No amount of bed rail or gate was going to keep this baby in. Meanwhile, Lucas conquered the crib with aplomb and wasn't giving it back. That meant I was relegated to the pack and play, which has been moved into my room, which is now me and Lucas' room! And suddenly mommy and abba have no babies in their bedroom. That doesn't mean they sleep any better, of course. In the midst of all this, mommy commuted to London for a Shalva event on Wednesday, leaving us to unleash our fullest wrath on abba who was all alone and severely outnumbered for just under 48 hours. Mommy had two baby-less nights to catch up on sleep. She returned to an abba who had no voice and even less energy. 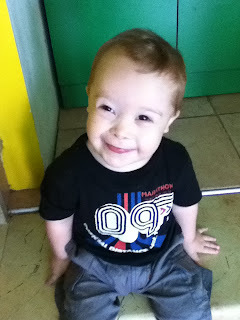 To welcome mommy back, Lucas and I have been taking turns serenading her through the night - to make up for lost time. It is an inexplicable phenomenon that while babies can have a bad night of sleep and carry on with energy and innocence, that adults seem to suffer much worse. I watch as they drag their feet, mumble incoherent phrases and hook up a small tube straight from the coffee pot to their arms. Poor parents!